Go ahead, spread it on thick. The smoothest, creamiest chocolate spread. 85% less sugar and 40% less carbs. Three times the protein for your muscles. The most intense cocoa beans and the finest roasted hazelnuts. You won't be able to stop yourself. On bread, on pancakes, or straight out of the jar. Treat yourself. Just the way you like it. Is there really no palm oil in your Protein Cream? Unlike conventional chocolate spreads, our Protein Cream doesn't contain any palm oil. Why? It's simple. Palm oil is known to contribute to rainforest destruction in Asia and the loss of countless animal habitats around the world. 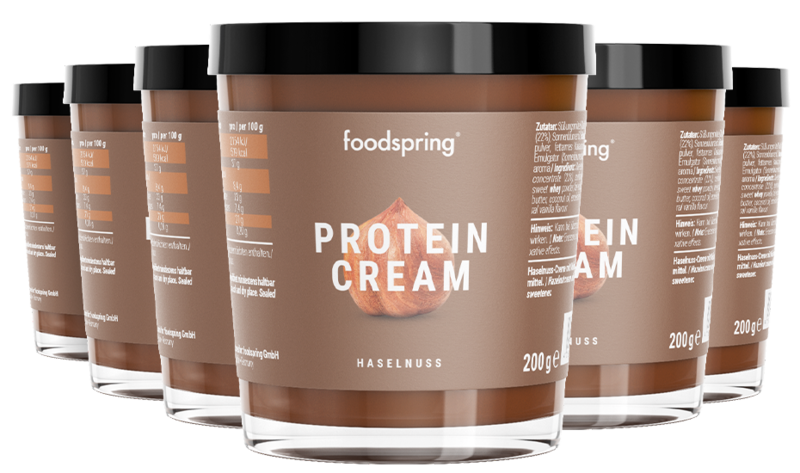 Our Protein Cream is still delightfully creamy thanks to sunflower oil, cocoa butter, and coconut oil. Why does your Protein Cream taste so delicious, even without added sugar? Regular chocolate spread usually contains up to 50% sugar. Our Protein Cream doesn't contain any granulated sugar. Instead, we use maltitol for our Protein Cream. This sweetener is 75–80% as sweet as sugar with only a fraction of the calories. How much Protein Cream can I eat if I want to lose weight? To lose weight, you need to consume fewer calories than you burn. Protein Cream contains whey protein, healthy fats, cocoa, and hazelnuts, and these contain calories. However, the nutritional values for our Protein Cream are much better than conventional chocolate spread: fewer calories from sugar, more calories from proteins and saturated fats. These keep your body going for longer. Do I have to keep the Protein Cream in the fridge? Our Protein Cream is best enjoyed at room temperature. This keeps it nice and soft so it will spread easily on bread and melt evenly on your pancakes. Or on your tongue, straight off the spoon. Protein Cream will be back in stock shortly.